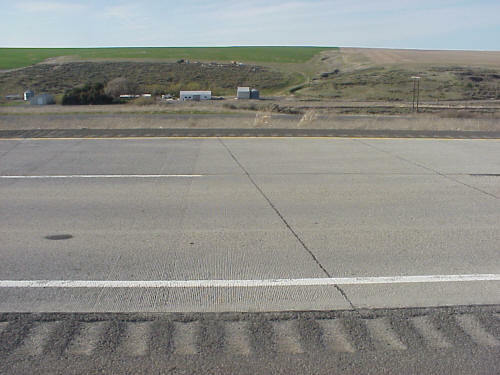 Joints are purposefully placed discontinuities in a rigid pavement surface course. 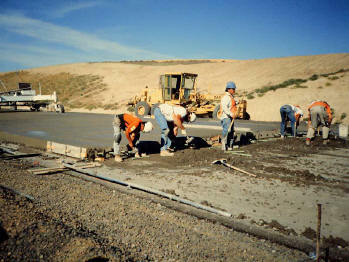 All types of joints are used in rigid pavement construction methods for all PCC pavement types. CRCP uses longitudinal reinforcing steel in order to limit the number of transverse contraction joints, but it still uses longitudinal joints and periodic transverse joints. Joints can be formed in two ways. Contraction joints are most often sawed in after PCC placement. Others such as expansion, isolation and construction joints, are created by formwork before the PCC is placed. Each one of these methods of joint construction has its own method and set of considerations. A contraction joint is a sawed, formed, or tooled groove in a concrete slab that creates a weakened vertical plane. It regulates the location of the cracking caused by dimensional changes in the slab. Unregulated cracks can grow and result in an unacceptably rough surface as well as water infiltration into the base, subbase and subgrade, which can enable other types of pavement distress. Contraction joints are the most common type of joint in concrete pavements, thus the generic term “joint” generally refers to a contraction joint. Contraction joints are chiefly defined by their spacing and their method of load transfer. They are generally between 1/4 – 1/3 the depth of the slab and typically spaced every 3.1 – 15 m (12 – 50 ft.) with thinner slabs having shorter spacing (see Figure 1). 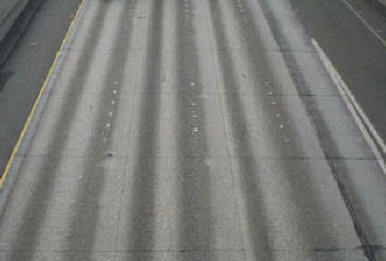 Some states use a semi-random joint spacing pattern to minimize their resonant effect on vehicles. These patterns typically use a repeating sequence of joint spacing (for example: 2.7 m (9 ft.) then 3.0 m (10 ft.) then 4.3 m (14 ft.) then 4.0 m (13 ft.)). Transverse contraction joints can be cut at right angles to the direction of traffic flow or at an angle (called a “skewed joint”, see Figure 3). Skewed joints are cut at obtuse angles to the direction of traffic flow to help with load transfer. If the joint is properly skewed, the left wheel of each axle will cross onto the leave slab first and only one wheel will cross the joint at a time, which results in lower load transfer stresses (see Figure 4). Figure 4. Skewed Contraction JointNotice how the tire loads cross the joint one at a time. This introduces the axle load to the leave slab one tire at a time rather than all at once (as would be the case for a 90-degree transverse joint). 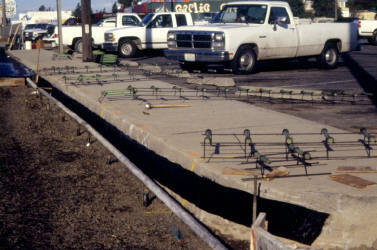 An expansion joint is placed at a specific location to allow the pavement to expand without damaging adjacent structures or the pavement itself. Up until the 1950s, it was common practice in the U.S. to use plain, jointed slabs with both contraction and expansion joints (Sutherland, 1956). However, expansion joint are not typically used today because their progressive closure tends to cause contraction joints to progressively open (Sutherland, 1956). Progressive or even large seasonal contraction joint openings cause a loss of load transfer particularly so for joints without dowel bars. 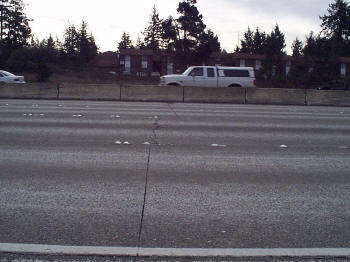 An isolation joint (see Figure 5) is used to lessen compressive stresses that develop at T- and unsymmetrical intersections, ramps, bridges, building foundations, drainage inlets, manholes, and anywhere differential movement between the pavement and a structure (or another existing pavement) may take place (ACPA, 2001). They are typically filled with a joint filler material to prevent water and dirt infiltration. 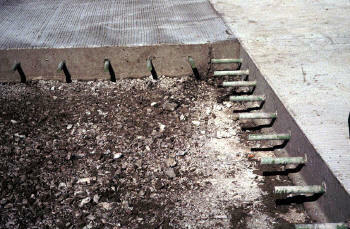 A construction joint (see Figure 6) is a joint between slabs that results when concrete is placed at different times. This type of joint can be further broken down into transverse and longitudinal construction joints (see Figure 7). 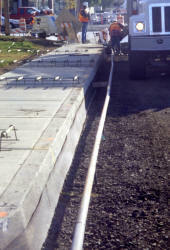 Longitudinal construction joints also allow slab warping without appreciable separation or cracking of the slabs. Workers manually insert dowel bars into the construction joint at the end of the work day. Construction joints should be planned so that they coincide with contraction joint spacing to eliminate extra joints.